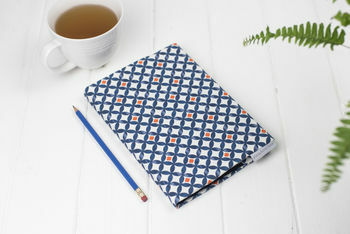 Blue and orange fabric with a geometric circle pattern covers this sketchbook. Portrait orientation, available in A6 or A5 sizes. Good quality cartridge paper. 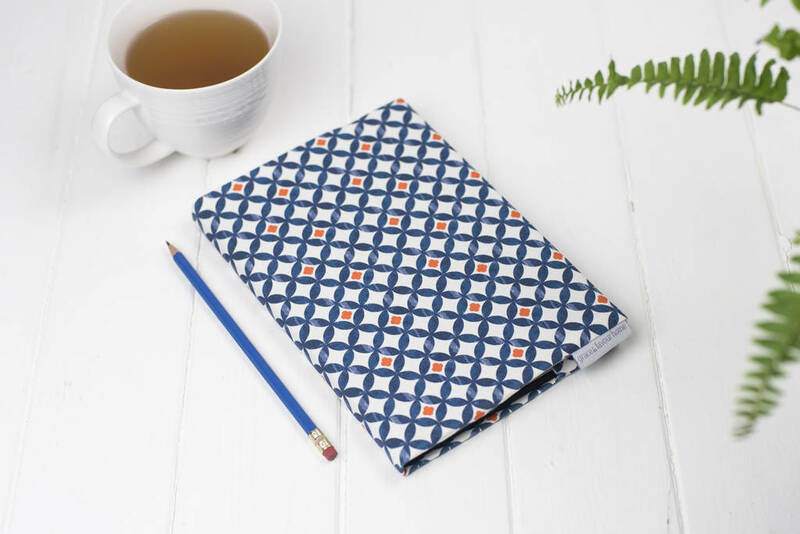 This lovely notebook is a great present for a writer, artist or list maker! Its cover is made with high quality cotton digitally printed with our exclusive Safiya fabric, while the sketchbook inside is a casebound hardback book with 92 sheets of 140gsm cartridge paper, which can be replaced once you have filled each page! The pattern is based on watercolour brush strokes so has a good depth to it. The 'Cadiz' range of fabrics are a mix of geometric and abstract patterns with a colour scheme of deep blues and vibrant oranges. the four other coordinating fabrics are named Alta, Isabel, Paloma and Marisol.